The PURPLE GHOST MARTINI is a really delicious raspberry vodka martini with tones of orange from the Cointreau and a good dose of anti-oxidants from the pomegranate juice. It has this really deep purple magenta color that looks great when you float a Ghost Peep on top. 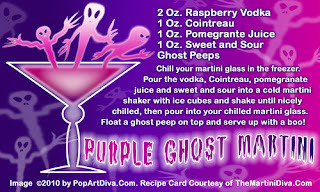 I got extra peeps and dipped them in chocolate for my Halloween Buffet dessert bar - they go great with this martini too! Don't have time to carve a pumpkin? No problem, grab a few black magic markers in various sizes and draw on a scary pumpkin face! Do a search online for pumpkin carving patterns . You don't even have to put on a face! Simply grab a few pumpkins and some of the fun seasonal squashes in various colors at the grocery store and do a nice grouping with some candles. You can make ghosts to hang around with plastic grocery bags. Cut your bags into different sized squares for different sized ghosts, put a wadded up paper towel or toilet paper in the center of the square, gather the bag around the paper stuffed "head" and tie it off with string or a rubber band. You can paint a spooky face on it with your black markers. Grab a can or two of matte black spray paint (Walmart's brand is cheap and dries very quickly!) and spray a few branches from your trees and set them around various areas with Halloween Candles or those great new battery operated votive candles . Dry ice is a great way to create atmosphere on your buffet and most grocery stores carry it. If you have a fog machine drag it out! 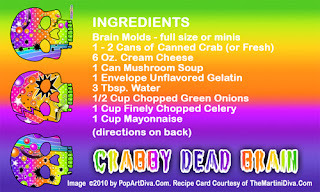 Party games are a great idea but if it's too late to pick up some of the cool Halloween party games try creating some of your own. I did a search for Free Halloween Games and found a ton of fun ideas.